For return filing the dealer should have log in credentials first. 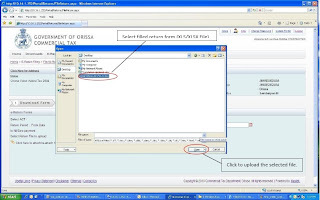 Dealer has to download and fill the e-return form (Return XLS format) from portal. Click Download tab to go to File download section. 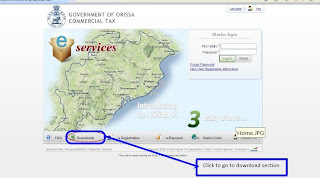 Download and Filing of e-Form (XLS file). Click on the form name, which you want to download as available under “Forms” section. 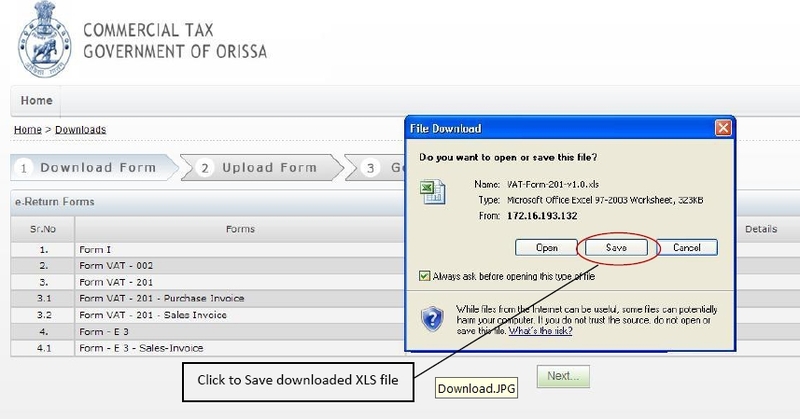 A XLS file will be downloaded It will ask for “Save” or “Open”. Click on “Save” button. Save the XLS file in local computer without changing file name. 1. 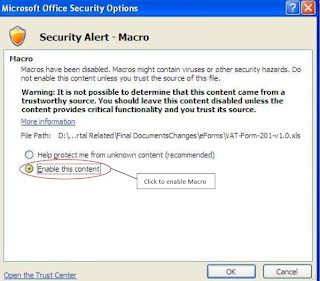 Microsoft Office 2003 or higher version must have installed in your local computer in order to open and fill the form after saving. 2. Please don’t change the form name while saving. It may cause problem while filing return in portal. Fill all the fields as available in the form. Please note that all the fields are enterable. There is no auto calculation in the XLS form. Fill the annexure form as well. Please don’t change any structure, label, work book name etc as available in the form, it may cause problem while filing return in portal. Fill the XLS sheet. Fill annexure as per requirement. Fill invoice XLS sheet for VAT-201 if you have invoice details. To fill invoice detail you need to download the Form VAT 201 –Purchase Invoice and VAT 201 –Sale Invoice separately. Follow the procedure as stated in point 1 of Return Filing to download and save invoice sheet.Click on Validate button.View Error in the Error Workbook. Correct the Errors and again click on Validate button. Continue the process till there is no error in Error workbook.If there is no error then Save the XLS files.This process is applicable for filling of e-form (XLS file) for VAT/CST/ET Act. 1. After completing the entire process of filling and validating the e-Form (XLS file), now you need to upload the upload the e-form (XLS file) in e-service portal. Please follow the below steps to upload e-form (XLS file). Log in to portal using TIN/SRIN and password. The following screen will be displayed. 3. Select Act for which you want file return. The last return period is populated automatically as per your return filing frequency as available in concerned circle during the registration process. Follow the screen below to change the return period. Click on the image (shown in above screenshot) and the calendar is displayed. 5. Click on <” link of calendar to view previous month. Click on “>”link of calendar to view next month. 6. Click on date to select Form Date of return period. You should select 1st date of a month for Form Date of return period Follow the above process to select To Date of return period. You should select last date of a month for To Date of return period. 7. Click on “Browse” button to select the filled return form (XLS file) from your local computer. The return form may be XLS or XLSX depending upon the version of Microsoft Office. E.g. For return filing of VAT 201 select saved VAT-Form-201-V1.0.XLS file from your local drive of your computer.Follow the below screen shot to select the saved return form (XLS file). 1. 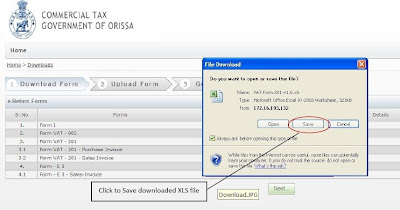 Select the return form (XLS file depending upon the version of Microsoft word) and click the Open button to upload the selected return form (XLS file). 1. Please don’t change the file name while filling and saving the return file (XLS file). On clicking the open button the following screen is displayed In case you are filling the Nil / Zero return then please select the check box “Is Nil / Zero Payment”.For Nil / Zero return you should fill the return form (XLS file) accordingly. 2. Click the Next button to upload the selected return file in portal for selected Act and return period. In case of any wrong entry/information in return form (XLS file) an error page is displayed stating the error available in the return form. In that case you have to check your return form (XLS file) for wrong entry, correct the entry and save the return form (XLS file). 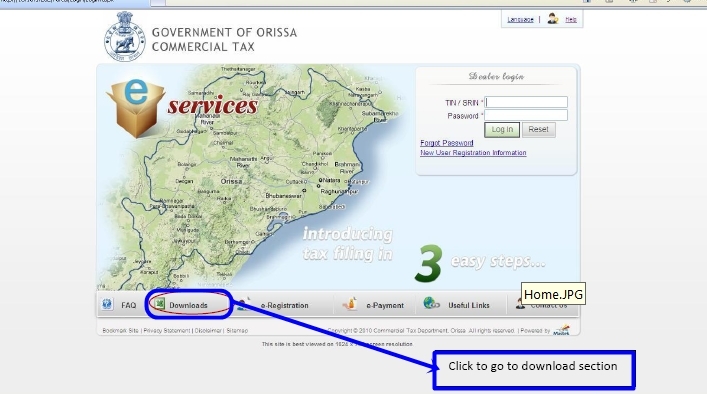 You have to follow the steps of Uploading e-form (XLS file) in e-Service Portal from the beginning. If there is no wrong entry / information is available in return form (XLS file) then the following screen is displayed on clicking the Next button. This page is to view summary of the return and confirm your return filing for the selected Act and return period. 3. Click on the Cancel button in case you don’t want to confirm the return filing. On clicking Cancel button you will be directed to File My Return page. To file return again you have to follow the steps of Uploading e-form (XLS file) in e-Service Portal from the beginning.Click on Confirm button in case you are confirming the return filing for selected Act and return period. 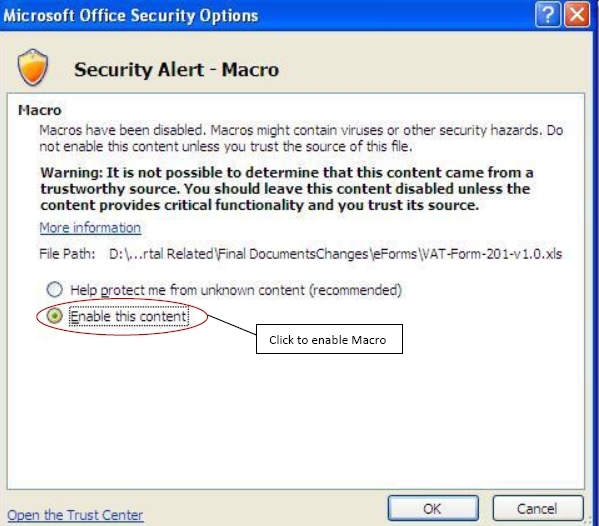 On clicking on Confirm button an alert message is displayed asking for confirmation again. Click OK button as displayed in alert message to complete return filing process. 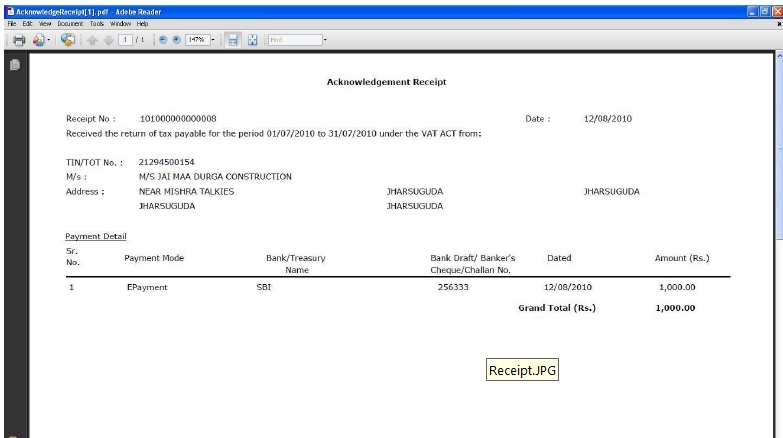 Click Cancel button as displayed in alert message to cancel the return filing.On clicking OK buollowing screen is displayed to generate acknowledgement receipt. 4. Click on Generate Receipt button to generate e-Filing acknowledgement. On clicking the button a receipt is generated in separate window with PDF file. 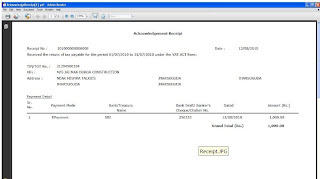 The receipt contains the payment details as mentioned in return form (XLS / XLSX file). 5. You can save and print the acknowledgement receipt. Please keep the acknowledgement receipt no for future reference and communication. Note: This is a computer generated receipt and doesn’t require any signature. Once the receipt is generated the return filing process is completed for selected Act and return period. 1. Click on Check Status link of the top menu to view the status of return filing. 2. 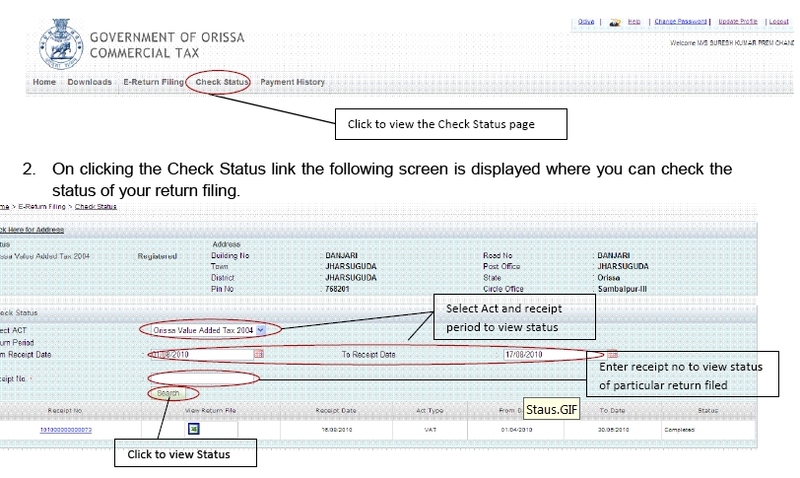 On clicking the Check Status link the following screen is displayed where you can check the status of your return filing. You can check status using Act and Receipt dates or Receipt no. To check status using Act and Receipt dates follow the following steps. 3. Select Act for which you want to check status. 4. Select From Receipt Date and To Receipt Date within which you want to check status. To select date follow the step mentioned in point no 4. of Uploading e-form (XLS file) in e-Service Portal. The receipt date or return filing date should be in between From Receipt Date and To Receipt Date. 5. Click on Search button to view status. 6. The status of the return filing is/are displayed below the search button. 7. Enter the acknowledgement receipt no that is provided after confirming return filing. 8. Click on Search button to view the status of return. 9. The status of the particular return filing whose receipt no is entered displayed below the search button. 10. Click on Receipt No to view the acknowledgement receipt for the filed return. 11. 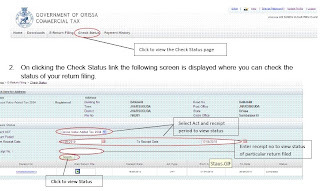 Click on View Return File (XLS image) to download the return form that you have uploaded for return filing for a particular Act and return period. 12. The status of return filing start with Pending. Once the payment is reconciled at circle office the status will be changed to “Completed”. If any Notice is generated by circle office for Arithmetic Mismatch or Payment Mismatch then the same status will be displayed in status column also. Check Payment History of return filing. 1. Click on Payment History link of the top menu to view the payment details that were submitted during return filing. 2. On clicking the link the following screen is displayed. There are different options available to search the payment details submitted in payment details section of return form. You can view payment history by selecting Act and Receipt period or Receipt no. You can check payment history using Act and Receipt dates or Receipt no. To check payment history using Act and Receipt dates follow the following steps. 3. Select Act for which you want to check payment details. 4. Select From Receipt Date and To Receipt Date within which you want to check payment details. To select date follow the step mentioned in point no 4. of Uploading e-form (XLS file) in e-Service Portal. The receipt date or return filing date should be in between From Receipt Date and To Receipt Date. 5. Click on Search button to view payment details. 6. The payment detail(s) of return filing is/are displayed below the search button. 8. Click on Search button to view the payment details of return. 9. The payment details of the particular return filing whose receipt no is entered displayed below the search button. This completes the payment history section.